EDJOIN is committed to respecting the privacy of our users. We strive to provide a safe, secure user experience. This Privacy Statement sets forth the online data collection and usage policies and practices that apply to all of our Web sites (www.edjoin.org and edjoinJobs). By using the EDJOIN web site, you consent to the policies and practices described in this Statement. Your data will be stored and processed in the United States. If you access the EDJOIN web site from outside the United States, your usage of the site constitutes consent to the transfer of your data out of your country and to the United States. Our sites contain links to other Web sites over which we have no control. EDJOIN is not responsible for the privacy policies or practices of other Web sites to which you choose to link from the EDJOIN Web site. We encourage you to review the privacy policies of those other Web sites so you can understand how they collect, use and share your information. This Privacy Statement applies solely to the information we collect on the EDJOIN Web site, and does not apply to information we collect in any other fashion. In some areas of our Web sites, EDJOIN requests or may request that you provide personal information, including your name, address, e-mail address, telephone, social security number, contact information and any other information from which your identity is discernible. In other areas, EDJOIN collects or may collect demographic information that is not unique to you such as your ZIP code, age, preferences, gender or interests. Sometimes we collect or may collect a combination of the two types of information. Examples of areas on EDJOIN Web sites where we collect personal or combined personal and demographic data are the EDJOIN Interest Card and the online Job Application. We also gather or may gather certain information about your use of our site, such as what areas you visit and what services you access. Moreover, there is information about your computer hardware and software that is or may be collected by EDJOIN. This information can include without limitation your IP address, browser type, domain names, access times and referring Web site addresses. Since we believe that managing your career is a life-long process, we retain indefinitely all the information we gather about you in an effort to make your repeat use with us more efficient, practical, and relevant. Of course, you can correct or update your EDJOIN account profile and resume at any time. Moreover, you can delete your resume and profile from our online database or close your EDJOIN account at any time, in which event your EDJOIN account profile information will no longer be searchable by the educational organizations that use EDJOIN to post jobs. An archived copy of your application information will still be available to districts/organizations to whom you have submitted your application using EDJOIN. We use the information we gather on the EDJOIN Web site, whether personal, demographic, collective or technical, for the purpose of operating and improving the EDJOIN Web site, fostering a positive user experience, and delivering the products and services that we offer. We may use your contact information in order to send you e-mail or other communications regarding updates at the EDJOIN site, such as new EDJOIN job postings which may be of interest to you. The nature and frequency of these messages will vary depending upon the information we have about you. We do not disclose to third parties your personal information, combined personal and demographic information or information about your use of a EDJOIN Web site (such as the areas you visit or the services you access), except as set forth in the following subparagraphs. Educational organizations in California to whom you submit your job applications will have access to all of the information provided in your EDJOIN job application as well as any attachments to your application. You’re age, gender and ethnicity information however is available only in aggregate form and is not viewable in connection to your individual job applications. These organizations may contact you using the contact information you provide on your job application. 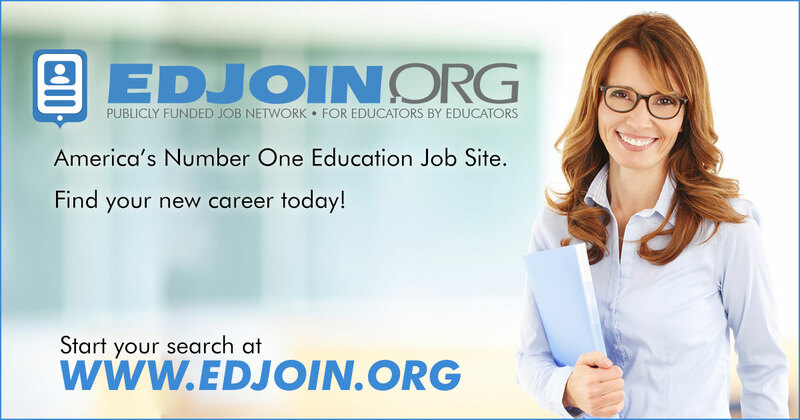 Educational organizations in California who use the EDJOIN system to post jobs also have the ability to search the job applications in the EDJOIN system. In addition, the California Teacher Recruitment Centers and the CalTeach organization can search the online applications as well as view aggregate information about the users of the EDJOIN system. These entities may contact you using any of the contact information provided in your EDJOIN profile or online application. There are email messages that are automatically generated by the EDJOIN system. For example, you should receive an email message from the system whenever you apply for a job on EDJOIN. This email will contain your EDJOIN username and password and will be sent to the email address in your EDJOIN profile. In addition, educational organizations that use EDJOIN can send email to you using the system. These email messages can also have your username and password appended to them. You’re EDJOIN username and password is not viewable by the educational organizations that use EDJOIN. The username and password is simply appended to their email message by the system when the message is sent. The EDJOIN web site uses "cookies" to help personalize your online experience. A cookie is a text file that is placed on your hard drive by a Web page server. Cookies are not used to run programs or deliver viruses to your computer. Cookies are uniquely assigned to your computer, and can only be read by a Web server in the domain that issued the cookie to you. You may have the ability to accept or decline cookies. Most Web browsers automatically accept cookies, but you can usually modify your browser setting to decline all cookies if you prefer. Alternatively, you may be able to modify your browser setting to notify you each time a cookie is tendered and permit you to accept or decline cookies on an individual basis. If you choose to decline cookies, however, that may hinder performance and negatively impact your experience on the EDJOIN Web site. You may review, correct, update or change your EDJOIN account profile information at any time. Simply log into your EDJOIN account, go to My Profile, review your account information and, if you wish, edit it with the options provided. To remove your profile, please contact the EDJOIN Jobseeker Help Desk. EDJOIN has implemented reasonable technical and organizational measures designed to secure your personal information from accidental loss and from unauthorized access, use, alteration or disclosure. However, we cannot guarantee that unauthorized third parties will never be able to defeat those measures or use your personal information for improper purposes. When you place an order online at EDJOIN, your personal information is protected through the use of encryption, such as the Secure Socket Layer ("SSL") protocol. SSL makes it difficult for your personal information to be intercepted while being transmitted. EDJOIN is not intended for children under 13 years of age. We do not knowingly collect personal information from children under 13. If we decide to change our Privacy Statement for EDJOIN, we will post those changes here so that you will always know what information we gather, how we might use that information, and to whom we will disclose it. If at any time, you have questions or concerns about EDJOIN's Privacy Statement, please feel free to email us at edjoinsupport@sjcoe.net or call us at 888-953-2155 (from 7:00 a.m. to 4:00 p.m PST, Monday to Friday) and speak to one of our representatives . EDJOIN is owned by CCSESA (California County Superintendents Educational Services Association). The site is hosted and maintained by San Joaquin County Office of Education. We welcome your comments concerning this Privacy Statement. If you believe that we have not adhered to this Statement, please contact us by e-mailing us at edjoinhelpdesk@sjcoe.net or call us at 888-900-8945 (from 8:00 a.m. to 5:00 p.m PST, Monday to Friday). Thank you for using EDJOIN.